Keeping your workers safe while they’re on the building site is your number one priority. And yet, there’s no reason why your workers can’t be safe and still represent your business with clean, stylish embroidered or screen printed hi-vis gear. At Lee T-shirts, we are in the business of garment decoration and in making sure that your business or brand stands out in the crowd. When it comes to hi-vis, there is a common element in terms of the colours used (orange, yellow, blue) and for that reason, it’s important that your business’ logo stands out as it should. If you have a team working for you, you want to make sure that they are advertising your business in the best possible way no matter where they are. It could be something as simple as an elegantly embroidered business name on the breast, or something like screen printing on the back of the hi-vis workwear or hi-vis vests that your team uses. No matter what you are after, we can help. We have been in the garment decoration industry in Brisbane for over 30 years and are dedicated to meeting your needs. Contact us today to find out how we can help you with your custom hi-vis workwear and decoration needs. At Lee T-shirts, no job is too big or too small. We offer our custom hi-vis workwear services to businesses across Brisbane and beyond. 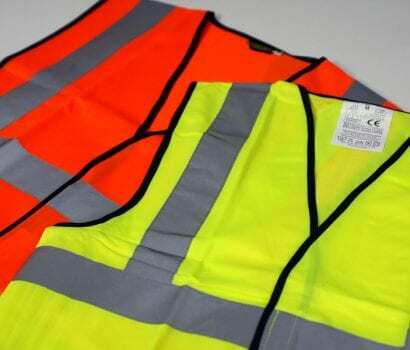 We’ve worked with businesses where there are only a few workers, through to large companies where there are numerous workers needing custom hi-vis. Whatever you have in mind, we can create it for you, so call us today and speak with us about your custom hi-vis workwear needs. Make sure that your workers on the site are the ones who stand out with your custom workwear and hi-vis. When you work with us at Lee T-shirts, you can rest assured of a quality product with attention to detail and exceptional care. We are trusted garment decorators who work with businesses across Brisbane and south-east Queensland, delivering quality finished products that really stand out. When your workers all have their own branded shirts promoting your business, it’s easy to spot your team on site, and it’s a wonderful way to present a united front for your company. Enjoy quality workwear decorated with clean, elegant embroidery or printing. We are dedicated to providing quality workwear for your business, including hi-vis vests, hi vis workwear, hi-vis gear and other hi-vis garments that are sure to keep your team safe and protected on the worksite. This kind of workwear is a popular choice when it comes to making an impact on the worksite. You can order a few custom options, or you can make a bulk order to outfit your entire crew. For hi-vis workwear that offers custom design and a comfortable fit, you can’t go wrong with Lee T-shirts. We use the latest in quality workwear printing and design and are happy to print any kind of design or text onto your shirts or workwear. We can match logo colours if you so desire, or can print in single colours for impact. When you’re going on and off the worksite and need to get a hi-vis vest to keep you safe, we can help to keep your company logo visible as well. High vis vests offer exceptional safety and are an effective way to make sure that you’re meeting compliance standards on the worksite. We offer screen printing or logo printing for your hi-vis vests and ensure that every job is completed to the highest standard. There is a range of hi-vis gear that is just crying out for your business name and logo; things like hi-vis overalls, hi-vis coveralls and hi-vis pants. When you work with us at Lee T-shirts, you will enjoy being able to promote your business on every surface with quality embroidery or screen printing that’s designed to last. We offer great value for money and the highest standards of care for every garment that we decorate. So whether you’re a plumber, a chippie, a sparkie, a brickie, a surveying company, a government agency looking for quality workwear or someone else entirely, you can rest assured that if it’s hi-vis, we can embroider or decorate it to perfectly suit your needs. Why You Need High-quality Custom Printed Workwear! When you have workers that are dealing with high-risk situations, you need to ensure that you are providing your staff with the necessary protective gear. Even better if it is created with an insignia that allows them to represent your company! Give your employees the peace of mind to know that they have quality workwear for their jobs and they will be happier and more respectful of your company. Get in touch with us at Lee T-Shirts for the very best in quality custom workwear and hi-vis gear. We are dedicated to making your business stand out while keeping your workers safe. We’re located in Brisbane but can service your business no matter where you are in Australia. Contact us for a free quote online or call us direct on (07) 3265 3258 today.